Since sequencing the human genome, the Sanger Institute in the UK and the US National Human Genome Research Institute have turned their sights — and their vast sequencing capacities — to cancer. Cancers can be thought of as genomic diseases, caused by somatic mutations, and progressing by the accumulation of further mutations. Last week, Nature published online the papers describing two new cancer genomes, bringing the total number of human cancer genome sequences published to five. Pleasance et al sequenced a malignant melanoma and a lung cancer cell line, comparing them to the genomes of healthy cells from the same individuals. Melanoma and lung cancer are good choices, since each has a very strong association with a specific cause — UV radiation and tobacco smoke respectively — and their causes are as different as two carcinogens can get, so comparison of the genomes of such tumours could tell us interesting things about the types of genes and chromosomal regions susceptible to physical versus chemical carcinogenesis. These publications are more important as a symbol of where cancer biology is going than for the actual results that they report, though. Because they report on the genomes of one individual tumour each, we can draw from them little in the way new conclusions about cancer in general. In each case, the genome sequence was derived from a metastasis, meaning that the cancer was at an advanced stage: its cells would likely have been subjected to many stresses, may have lost many of the mechanisms that protect the genome against further damage, and would therefore have picked up a large number of mutations and chromosomal rearrangements long after the initial carcinogenic transformation event. To further complicate matters, both the cancer cells and the control cells taken from the same individuals were established cell culture lines. Cells do not naturally find themselves in petri-dishes, and do not tend to grow very well outside of the body. In establishing cell culture lines, therefore, cells are subjected to all sorts of additional stresses, and natural selection means that the cells which survive in a dish may not be entirely representative of the starting population of cells. These genome sequences, then, show us that these cancer cell lines contain tens of thousands of mutations, but it’s difficult to say which of those might have been caused by the original carcinogenic attack and could have had a role in the cancerous transformation; which were picked up as the tumour grew, its cells competed, and further adaptations — like invasion and metastasis — were acquired; and which were produced by the act of establishing cell lines. The authors do a little preliminary bioinformatic analysis using software which seeks mutations in functional sequences, but here the original limitation of the papers — that they have a sample size of one — prevents us concluding much that we didn’t already know. That’s not to say this isn’t exciting. 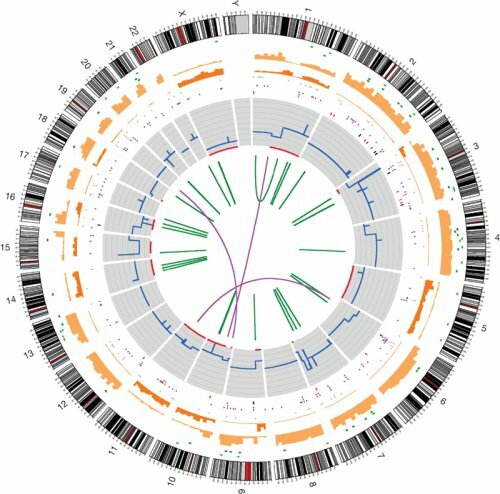 These papers herald the truly important results of the cancer genome projects that will emerge when the sample size is in the hundreds or thousands, when we have sequences of sequences showing how tumour genomes evolve as they progress, and comparative cancer genomics potentially revealing signatures common to all examples of a particular cancer, or tumour sub-types that react to different treatments. We’ve taken the first steps into cancer genomics over the past decade — from genome-wide association studies and high-throughput comparative genomics with technology like microarrays, to the first trickle of whole-genome sequences. It’ll be thrilling to see where it goes over the next — what it reveals about basic biology, and how far it advances personalised medicine. ^ The authors say: “If the majority of mutations derive from the mélange of mutagens present in tobacco smoke, the clone of cells that ultimately becomes cancerous would acquire, over its lifetime, an average of one mutation for every 15 cigarettes smoked.” I suspect that this could be a slightly misleading picture of cancer biology, and it would be interesting to know whether it really is true that the majority of mutations in an advanced lung cancer cell line are related to the original carcinogens rather than stresses in the progressing tumour and cell culture.